Today was a day of last minute shopping, even if it was just for food! I picked up the ducks that we'll be roasting on Sunday, and some other groceries, and we went to the Korean super-mega-grocery-store for lunch. It's on the way to the mall, which we generally try to avoid by this point in the holiday season, and with good reason. As we were heading back home, the traffic to the mall was backed up for miles! 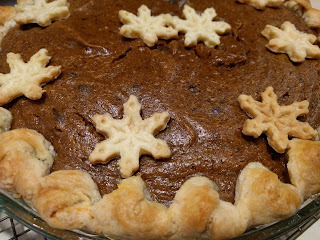 Also this morning I made our pie for Sunday, chocolate sweet potato. Yum. This is definitely my favorite, I think. I'd had the sweet potato purée in the freezer so thawed that out and then, since it wasn't hot, I melted the chocolate to mix with it rather than toss chocolate chips into warm purée and letting them melt. Everything else was basically the same. Oh, except I tried something different with the crust edge. I'd hoped for some sort of braid or basketweave but that wasn't working out so instead I just twisted strips of dough together. I think it came out rather pretty in the end, don't you? When we're ready to serve dessert I'll make the bourbon whipped cream to go with it. Tomorrow I have to work; I'm hoping that it's not too crazy and I get out at a reasonable time. Today we went and delivered a lot of the neighborhood gifts, but there are six more houses to go and I want to try to get as many delivered as possible before Sunday.